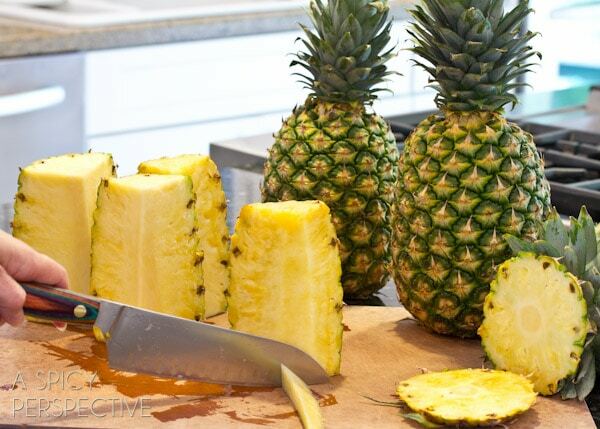 How to cut a pineapple: Three easy ways to deal with prickly pineapples. A friend recently told me that she is afraid of pineapples. It made me wonder who else might be afraid of pineapples. Anyone? Consider yourself in pineapple samurai training today and I am your ninja master. You can do it, little lotus flower. 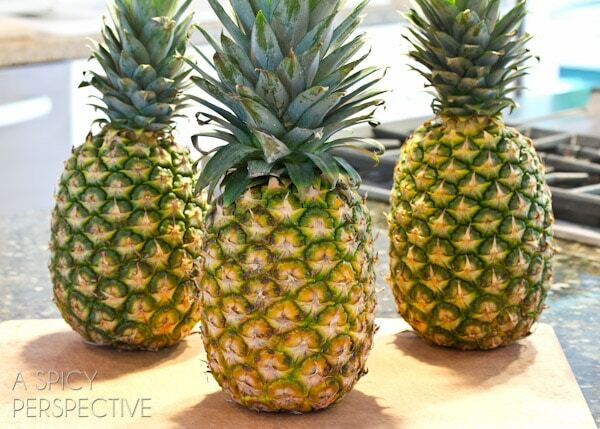 Start by choosing a symmetrical pineapple with “eyes” that are evenly sized. The more yellow the eyes, the riper the pineapple. 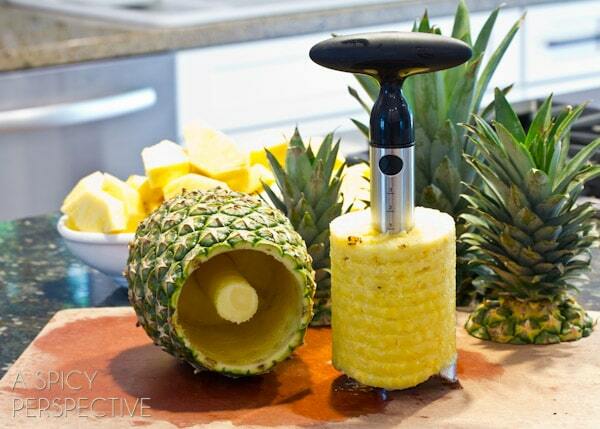 Cut off the top and bottom of the pineapple so you have an even cylinder. Now you have several methods to consider. 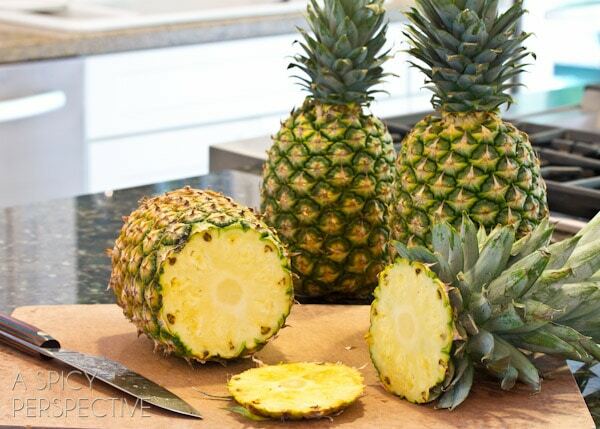 If you want small pineapple pieces for salads and snacking, cut the pineapple into quarters lengthwise. Then slice of the tip off each section. This removes the tough fibrous core. 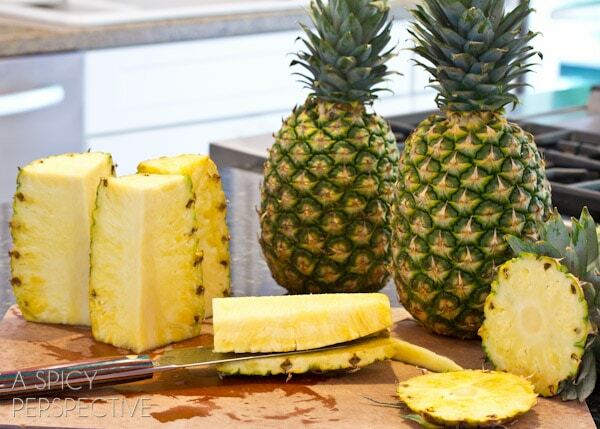 Lay the pineapple section down and cut inward, about 1/3 – 1/2 inch above the eyes. Do this on both sides to separate the fruit from the skin. 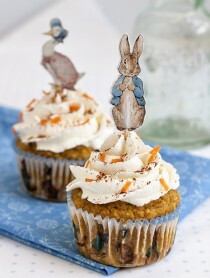 Slice into sections and enjoy! If you want pineapple rings…. 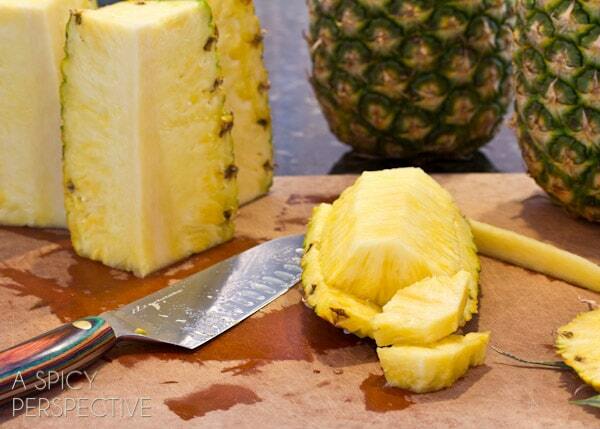 Shave the skin off the pineapple, by cutting in 1/3 – 1/2 inch to remove all eyes. Rotate the pineapple and repeat around the entire pineapple. 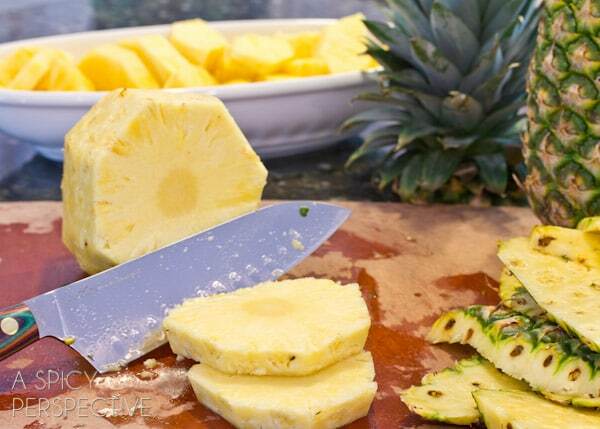 Then slice the pineapple into rings. 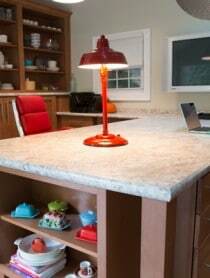 To remove the core, use a spoon to cut out the middle, or use an apple corer. 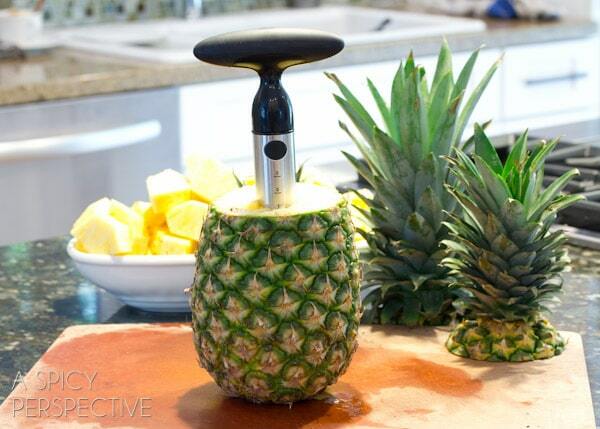 How to Cut a Pineapple Option 3… buy a cool pineapple coring tool! OXO makes this one and it works like a charm. 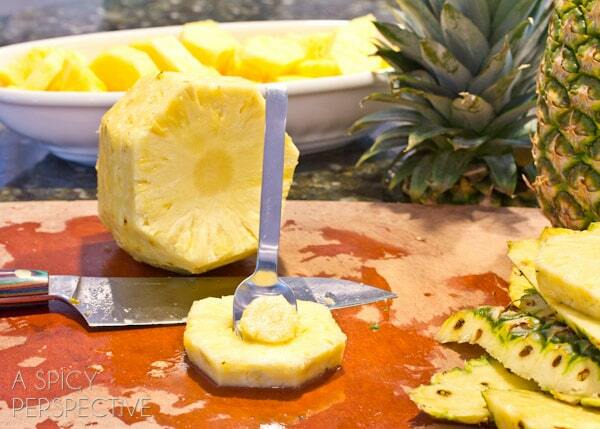 After you cut off the top, simply screw the pineapple tool down over the core. Stop when you get close to the bottom. Then lift the whole fruit center out, like this. Then remove the bottom of the tool and the pineapple rings slide right off! Neat, right? 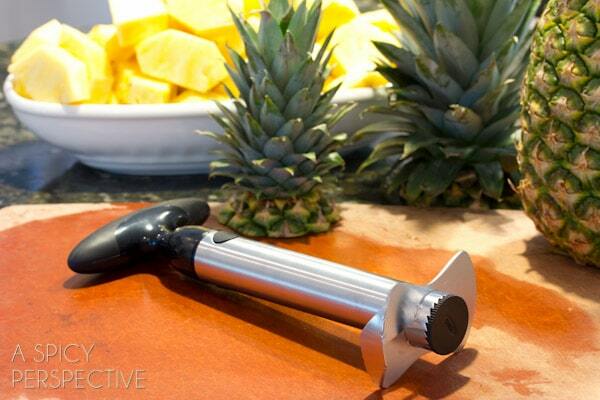 Great post, I love pineapple and have the OXO corer and it makes pineapple prep so EASY! I’ve always wanted to try one of those pineapple corers! What a fun tool! I remember my grandmother carefully using a knife to cut all the eyes of the pineapple out. She’d use diagonal cuts and follow the eyes down the side of the pineapple. p.s. Pinterest (new version) won’t let me tag you anymore.. hopefully that’ll get fixed soon! 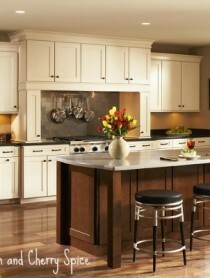 I LOVE all of your cool kitchen gadgets! I may have to get this one so I can create cool rings, and not have to buy pineapples in a can anymore. :) Thanks! I love your instructional posts and this one is is perfect because it’s time to break out those summer pineapple dishes. I’m with you – that leftover pineapple just looks like it’s waiting for some pina colada filling! Great tutorial, Sommer. 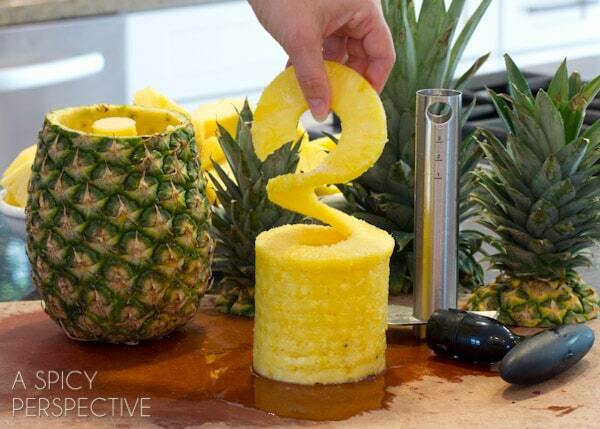 I seriously want that OXO pineapple corer!! I need that pineapple tool because oh mah gooosh, looking at my pineapple carcass after I’m done with it is both maddening and saddening, haha. Love these tips! 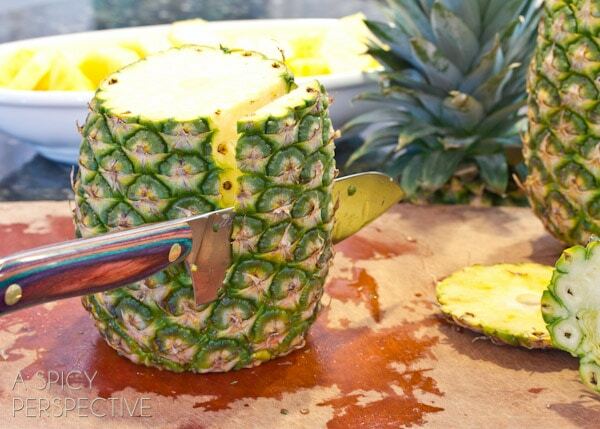 Great tips, now I can make my pineapple pops much more efficiently ;). I seem to cut alot of pineapple in the summer as it is a favorite fruit to take to swim meets in my house. Until I learned how to cut it as you demonstrate here I too was completely intimidated. There is noting intuitive about approaching these large thistles! LOVE the cool spiral cut tool! Very fun. Always love your tips, Sommer! I am too obsessed with pineapple to not know my way around the darn things! Ahhh, love pineapple, great tips and tutorial!! Thank you Pineapple Ninja! Great tips! What is that beautiful knife you are using in the picture? Now I want a big fruity summer drink! Great tutorial! This looks so much easier and more effective. I usually still have all of the little “spikies” left to pick out! 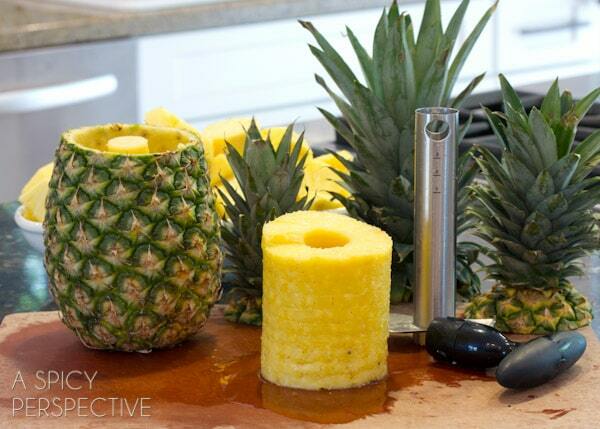 I have a pineapple cutter tool, I love it. Fresh Pineapple is so, so good! I want the OXO tool! I have been cutting to much pineapple lately! i’ve been wanting to get that OXO tool! it seems so convenient! i always have issues with cutting pineapple and pretty much avoid it, but thanks to your great tips, this will help me out a bunch! This is great! I need that tool!! The tool is my new favorite way! It’s so easy!